Roger Waters, if nothing else, was a persistent mofo. The man really liked his Wall and Final Cut leftovers/reworkings, and his vocal style of “now i’m soft now I’m loud” while only actually singing in his delivery about a quarter of the time, and his sound effects, and his impenetrably dense concept albums. The album does have an overarching concept, but it’s incredibly obscure and abstract, and its main purpose seems to be to give Waters a stage on which to rant against war, God, capitalism and complacent people in a span of 75 minutes. If you’re the kind of person that considers The Final Cut “non-music,” you should stay far away from this, and like all Waters solo efforts, Pink Floyd fandom is no guarantee of enjoying this. I like this way more than his other solo albums, though. With so much lacking in the music from an ‘immediate satisfaction’ angle, the only hope for making me enjoy this would be for it to hit my emotional center with force, and it definitely does that. This is definitely Waters’ peak as a lyricist, and when his honed wordsmith skills are combined with his usual vitriol towards his various abstract enemies, he’s able to convince me (at least in the moment) of the strength of his arguments. It’s not so much that I agree with Waters all the time on here (though there are certainly many times when I do completely) as it is that I can, without difficulty, see the point of this album existing, and that’s definitely not something I could really say about Hitchhiking or KAOS. Musically, there aren’t a lot of particularly memorable stretches, but the ones that are memorable tend to pop up at very opportune times and are done in very effective ways. I don’t see how it’s possible, for instance, to not have the backing vocals (first done by a woman, then by a throng of people) of What God Wants force their way into your psyche, especially in the way they seem to magnify the power of Waters’ rants in between them (in the first two parts of the song; the third has less oomph and less impact on me, though the ending stretch of sound affects is amusingly bizarre). I don’t see how it’s possible to not be moved by the rambling-yet-powerful featured female vocal in Perfect Sense Part I (hell, I think it reflects a dangerously oversimplified worldview that I don’t 100% agree with, and I’m still moved by it), or the soft descending piano part or the anthemic build in the chorus of the same. 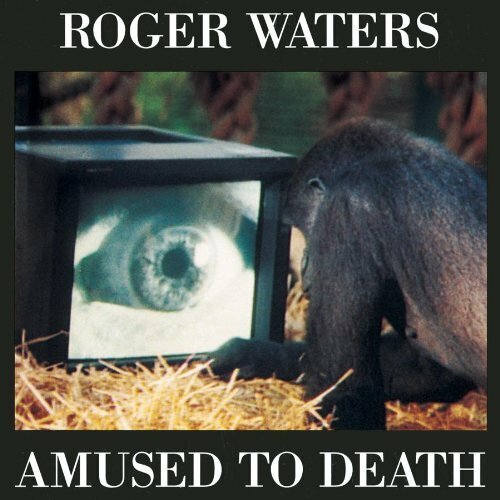 I can see how it’s possible not to be moved by the repeated soft “amused itself to death” coda in the album-ending title track, but I prefer to ignore the possibility. As usual, Roger’s mastery of sound effects, atmosphere and anything that can be used in music that isn’t actually music is nearly unsurpassed (I’m sure there are others better, but there aren’t many). Starting and ending the album with excerpts from an interview with an old army veteran about his experience in having to leave a fellow soldier named Bill Hubbard behind on the battle field, gravely wounded, and about dealing with the aftermath of it, was simply a fantastic idea, I think. Arguing against war in abstract terms is always less effective than bringing a ‘human element’ into the picture, and the narrative here is just so moving that I can’t help but tear up a little bit when listening to it with nobody around. And speaking of great sound effects, how about the funny Marv Albert guest appearance in which he announces an attack of a submarine on an oil rig in part II of Perfect Sense? It’s kinda banal, but it works well in context. Another highlight, mostly driven by atmosphere, is the penultimate It’s a Miracle, which I enjoy greatly despite not having any obvious tangible reason for doing so. It’s mainly just a bunch of light piano and eerie keyboards, a soft rambling vocal, and a some instrumental noodling, with less discernable melody than pretty much anything from the classic Floyd albums, but the combination of these simple elements and the close-to-defeated lyrics and delivery make it into something resembling greatness. Of course, I don’t even remotely love the album. A solid acoustic ballad or two would have helped things considerably (and no, I do NOT consider Watching TV to fit this requirement), and the general monotony of the sound brings me down over the course of the hour. I mean, there really isn’t that much distance style-wise between this and Hitchhiking; it just so happens that this album does that crappy style in a pretty good way. Still, this is a definite keeper, and it’s definitely the album to get if you just have to get a Waters solo album.